This weekend was the long awaited Appleseed rifle clinic in Ramseur, NC. I have been planning one going for quite a while now. I bought my 10-22 rifle with money made by selling the Gunwalker T-Shirts, and decided to fill it full of aftermarket parts to turn it into a Liberty Training Rifle. After that, it was just a matter of making time to go. 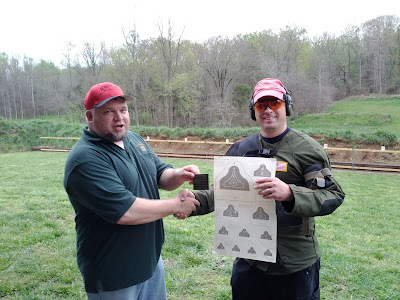 Since Chris and Heather of Arma Borealis moved to South Carolina, they suggested that we make it a blogger group and go to the Ramseur range, the home range of the Appleseeds. In the end, we had 8 people. Appleseed is a lot of work. You’re going to spend a lot of time on the firing line, shooting at some pretty small targets. The concentration necessary to do well is pretty wearing, but in the end, it will be worth it. That’s me receiving my Rifleman’s patch from Walter. This is the third test (AQT) that I shot, and I scored 232 out of 250. Minimum score to pass is 210. I shot it again twice on Sunday with Bob Reynold’s AR-15 and scored 225 both times. I think that once you get the hang of it, it gets easier. Out of our group of 7, we had 4 people qualify Rifleman, Me, Mr. Knightbane, Heather, and Bob Owens. Chris shot a 209 several times, but could never find that last point to put him over the top. Mrs. Knightbane made progress, but will need to return to shoot some AQTs, and Arms are the Mark of a Free Man just need a few more tries to get it. If you get a chance to go to an Appleseed, go. It’s a good time, especially if you bring some friends with you. Pay attention to the rifle requirements. It is certainly possible to shoot a bolt action rifle, but you will be much happier with a 10-22 and a bag of ammo. Larry wrote up a list of guns he wants. I think I shall swipe the meme and write my list. I got a chance to go to NorthCoast II Blogger shoot this weekend. Until Alan decided to fly in from Texas, I was the person who traveled furthest. Luckily for me, my parents live near Erie, PA, so I was able to visit them and drive the 2 hours each way to NCII. Total weekend mileage 2,100. It was eleven hours on Friday, eleven hours on Monday, and two hours each way, each day on Saturday and Sunday, for a total of 30 hours of driving. It was worth it. Our hosts were fantastic. The food was good. The shooting was excellent. They even provided us a car on Sunday to shoot up. I finally got a chance to try out my Liberty Training Rifle. I picked it up at the gunsmith’s on Thursday. I couldn’t get the factory front sight off without bending the barrel, so I had a gunsmith do it for me. He also installed the Uncle Mike’s sling swivels. Aside from that, I did all the parts installation. This rifle rocks. Old NFO showed me how to use a sling, and I spent Saturday shooting off a rickety folding table and shooting minute of milk jug at 75 yards. It was pretty cool to shoot the milk jug, realize that I had punched a hole at the top, so I finished the jug off with multiple shots to the bottom of the jug. Each hit caused the water to jump up in the jug. I can’t wait to see how much better I shoot once the Appleseed guys show me how to do it correctly. On Sunday I hauled it out again. It was actually pistol day, but I brought my father along that day and wanted him to see my new rifle. We were both able to shoot offhand (standing) at 25 yards and easily hit 4 inch circles. I think that they were plastic tops for cans. Whatever they were, it was an easy shot. There were lots of 5 gallon water jugs too. I would shoot them until all the water leaked out and then start shooting at the plastic cap on top to either blow the entire cap and spout off, or tip the bottle over. Those sights make all the difference. I can’t wait until rabbit season. I’ll get a photo of the completed rifle as soon as I have a chance. Well it looks like there is no possible way my “profits” from the sale of Gunwalker T-Shirts will stretch to cover a Kriss Vector. This really isn’t a surprise. I still want a Kriss, but I won’t be able to afford it any time soon. Instead, what do you all think about this? This is a photo of a “Liberty Training Rifle.” It’s a Ruger 10-22 decked out with nice aperture sights plus some special mods to make it operate basically like a M1 Garand. The LTR is the “standard” practice rifle for Appleseed shoots, something I’ve wanted to go to since I first heard of them. Their home range, in Ramseur, NC, is less than an hour and a half from here. I’m thinking of going either in September or October. The October date is the weekend before the NC Blogmeet and shooting class. 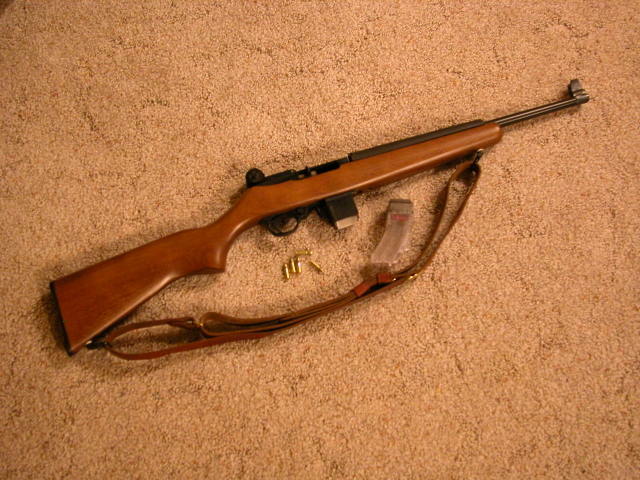 None of the mods make it less useful as a .22 caliber varmint gun, so I can still use it to go rabbit hunting on my friend’s farm like he asked me to. Plus, I can use it to teach people how to shoot. Some people find rifles less intimidating than pistols. The only problem is that I don’t have an M1 to use for the long range days at the Appleseed shoot. Does anyone want to loan me one?